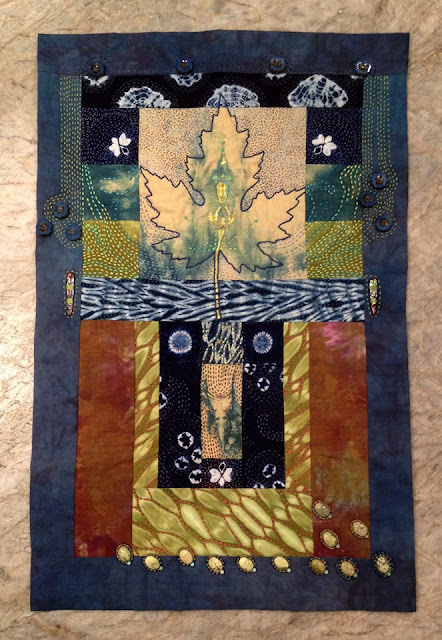 Instructing one of our long weekend, three day workshops this year is fiber artist Lisa Binkley. Her August 26-30 workshop on Layered Surface Design will give special attention to the interaction of beads and thread with fabric patterns. Lisa kindly took a moment to take part in our annual instructor interview series to share some of her perspectives on her work. LB: Nature, poetry, and the materials I use (fabrics, embroidery threads, and beads). LB: I’m proud of the quality of my craftsmanship and the thought that goes into each piece of art I make. LB: One of my biggest challenges is that I like to stick in very fine detail, so one quilt or embroidery may take six months or longer to create. I’m working on learning to stitch faster, but I still feel proud of the work I make. LB: My husband is a professional illustrator, and his feedback about composition has been very helpful. I also found Jane Sassaman’s* suggestions in her book, “The Quilted Garden” extremely helpful. LB: I’ve been dying a lot of my own fabrics the last few years, and I’m excited about a series I’m undertaking to start with white cloth and end up with pieced quilts that are entirely botanically dyed and printed by me and then intensely hand stitched with beads and embroidered threads. I’ll bring some with me in August! Learn more about Lisa’s workshop with us here. Learn more about Lisa on her website or follow her on Facebook and Instagram. *A fellow Hudson River Valley Art Workshops instructor! Jane’s workshop begins at the end of next month from April 30-May 6 and is entitled Abstracting from Nature. Learn more about her workshop here and read Jane’s interview with us here.